Secondcity’s ‘I Wanna Feel’ debuted at No.1 in the UK singles chart in June, with current sales of over 200,000 and counting. The track saw support from across Radio 1, Kiss, Capital, MTV, 1Xtra, and many more, gaining him critical praise from The Guardian to iD, Hunger, Mixmag, Digital Spy and beyond. 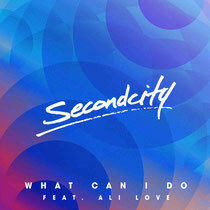 Secondcity aka Rowan, now returns with new single, ‘What Can I Do’, featuring Ali Love, and premiered by Annie Mac on Radio 1. With one foot in the charts, but his heart in the underground, Secondcity has kept his head down, releasing EPs for Defected and Saved, remixing FCL’s ‘It’s You’, and hitting the studio to create ‘What Can I Do’ between a live schedule with shows for Ushuaia Ibiza, Defected at Booom Ibiza and at Ministry of Sound, Motion, Arches and beyond. Recent festival dates include Creamfields, SW4, Reading & Leeds and Pukkelpop, plus he’s played at Privilege for Radio 1’s Ibiza event. Born and raised in Chicago until the age of 12, Secondcity has lived in the UK since his teens. Over the past 12 months he’s been championed by the likes of Pete Tong, Route 94, Huxley, Skream, Disclosure, MK and many more. His debut release, the four track EP, ‘The Story’, was released on Huxley’s Saint’s And Sonnets imprint and hit the Beatport Deep House Top 10. ‘The Story’ EP led to a remix for Miami Rockers on US house label Strictly Rhythm, while Secondcity and Route 94’s edit of ‘Freak Like Me’ and his production ‘I Enter’ for Dirtybird’s BBQ compilation all showcase his growing appeal. It’s out 26 October, check it out below.